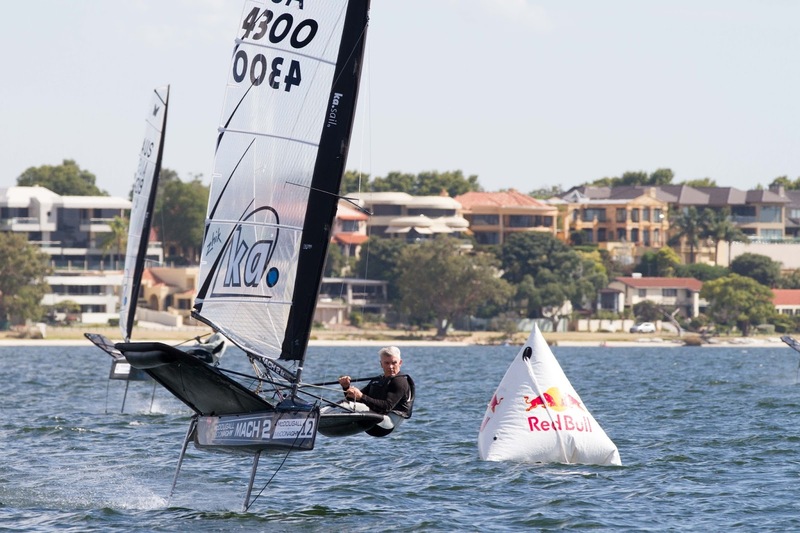 Little breeze and a top temperature of 42 degrees, made worse by a smoke haze from a serious bushfire in the south west, caused an extensive delay to today’s racing at the McDougall and McConaghy International Moth Australian Championship. North easterlies eventually gave way to a westerly airstream, allowing racing to start soon after 3:30pm, about 2 ½ hours after the scheduled start time. Crews were left ashore during the delay, most desperately seeking shelter from the stifling heat. In the mad scramble that followed the removal of the answering pennant, those at the back of the boat park barely made it to the start line in time. It made little difference to Josh McKnight, the Royal Prince Alfred skipper posting another two wins from two races and doing so with very comfortable margins despite the light and shifty conditions. Ed Chapman was one of those who was still in the boat park with just four minutes remaining before the warning signal, but composed himself to score a third and a second to cement his third spot on the leader board. Second placed Rob Gough had a second and a fourth, suggesting that the podium positions for the regatta are now almost unreachable for the rest of the fleet. With twelve races now completed, two drops have now been actioned, which has made some major changes to overall positions. Italy’s Stafano Ferrighi who is now able to drop scores of 50 and 55 respectively, moved up from 13th to 7th. Japan’s Kohei Kajimoto should also have benefited from today, but blew the chance with a U flag disqualification in the last race, slipping to eighth place. 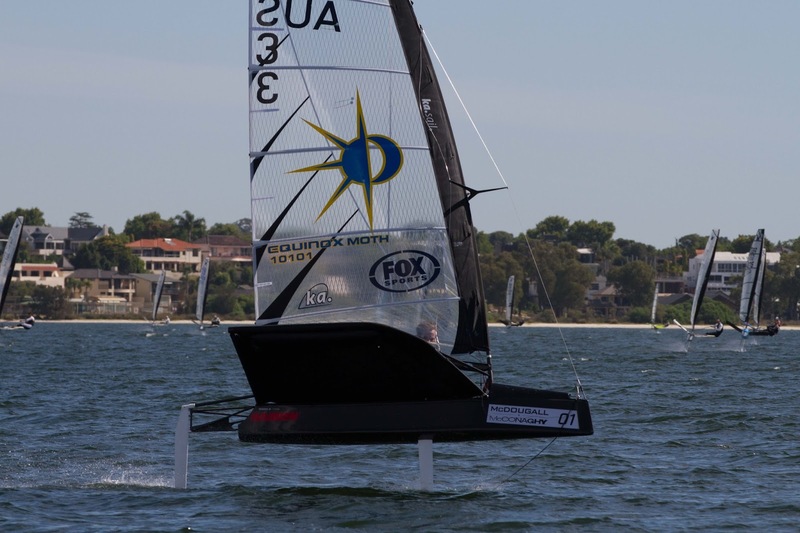 In the three lap final race, the breeze dropped off during the final lap, leaving half the fleet limping home without the benefit of foiling, a painful experience in the searing heat. During the morning, the Annual General Meeting of the National association decided to award three life membership in recognition of members who have made outstanding contributions to the class. 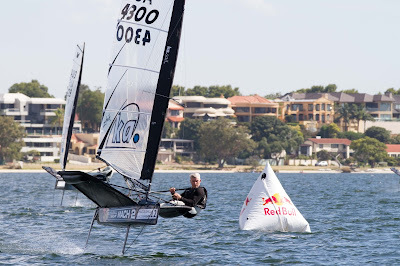 They were John Ilett, the West Australian carbon fibre specialist who is widely credited with as the innovator who was able to convert the theory of foiling into practice in the Moth class, New South Welshman Phil Stevenson and the old master Andrew McDougall. It is hard to think of three more deserving members, all of whom have dedicated a major part of their lives in promoting their class.